Congratulations! 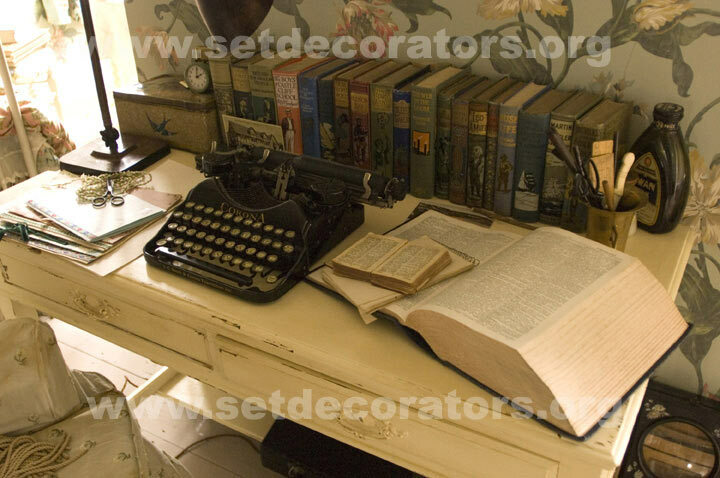 Set Decorator Katie Spencer SDSA and Production Designer Sarah Greenwood were awarded the BAFTA [British Academy of Film and Television Arts] Orange Award for Production Design for their work on the film ATONEMENT, which also won the BAFTA for Best Picture. They have been honored as well with nominations for the Academy Award for Outstanding Art Direction and the Art Directors’ Guild Award for Production Design of a Period Film. Opening with a dreamlike sequence in the luxurious English countryside on the hottest day of 1935, Director Joe Wright’s film ATONEMENT, based on Ian McEwan’s best-selling novel, crescendos into the surrealism of the evacuation of Dunkirk in 1940. The disquiet of summer doldrums infects the Tallis household, building as the day unfolds. A restive quality hangs in the dense, torpid air. Everything has reached full bloom. Flowers are bursting open, fruit pungently ripe, grasses are knee-high and filled with the drone of insects, nerves are put on edge by the incessant heat. 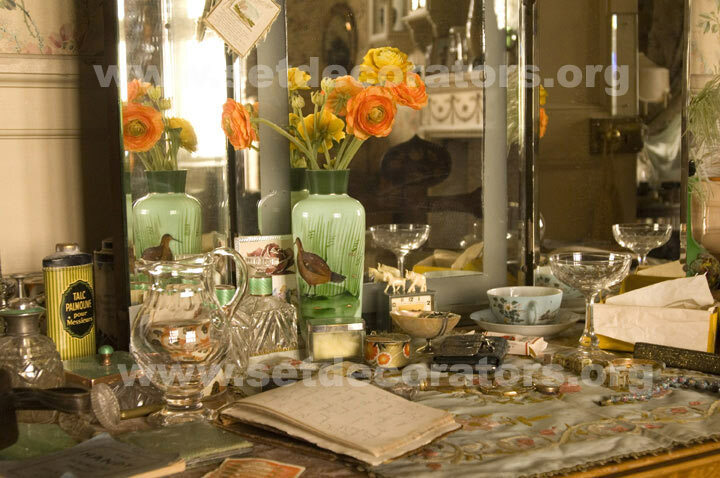 The chintz-covered sun-drenched rooms and dappled hallways are becalmed, dust motes static. In the underbelly of the house, deep green walls intensify the kitchen’s oppressive humidity; heavy glutinous mist rises from pots of steamed puddings. 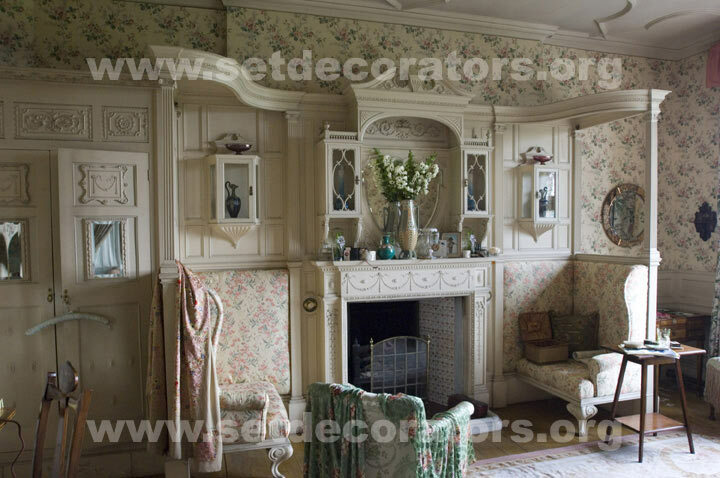 Upstairs, light plays through floral motifs and delicate colors, while shadows fill the recesses. 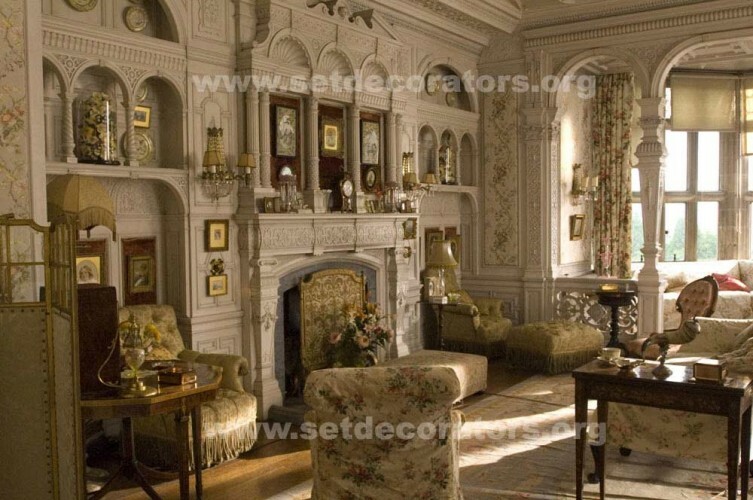 The sets not only depict character, they tell volumes and hint at more. 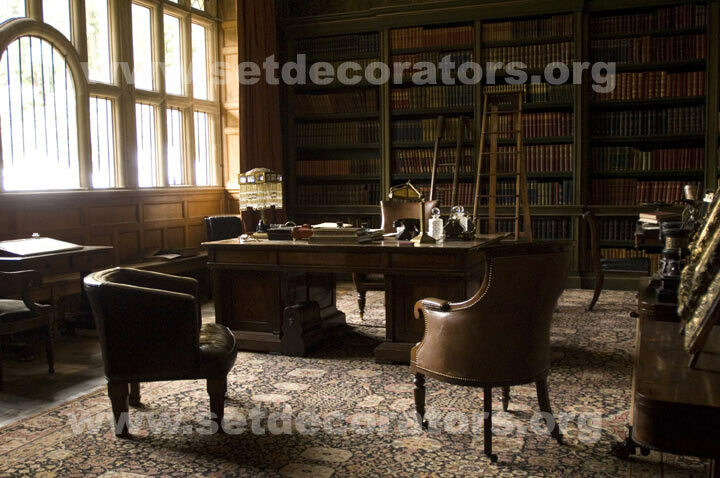 While digging through Country Life magazine archives for British home decorating styles of the 1930s, Set Decorator Katie Spencer SDSA and Production Designer Sarah Greenwood found photographs of Stokesay Court during that period. 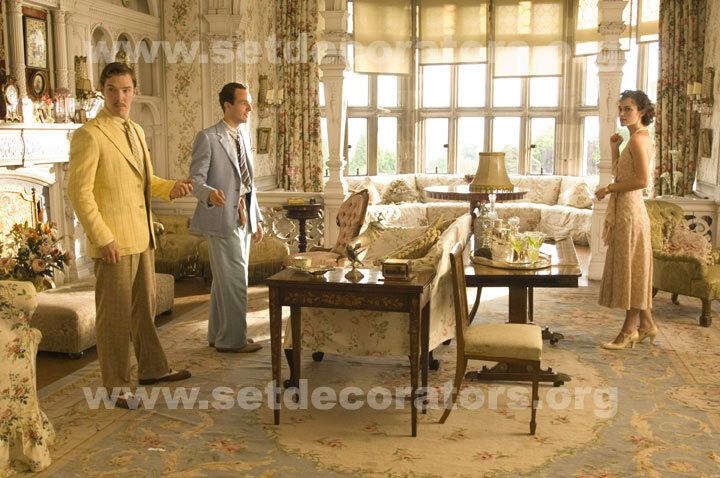 They further discovered that in 1994 the furnishings had been auctioned off and the estate sold. When plans for use of another country estate, Tyntesfield, fell through, the production was able to take over Stokesay, converting it into the manor setting for the 1930s segment of the film, Tallis House. The film shot chronologically, so the next sets were in London. According to Spencer, “Oddly enough, the Hospital Ward, a build, was one of the most difficult sets. Sarah had to design this huge hall because it was supposed to be St Thomas’ Hospital right across from Parliament, and then we had to fill it! You can find one or two period beds, but a ward-full?” Greenwood adds, “We wanted a Hospital Ward that was 120ft long and had that monumental quality. 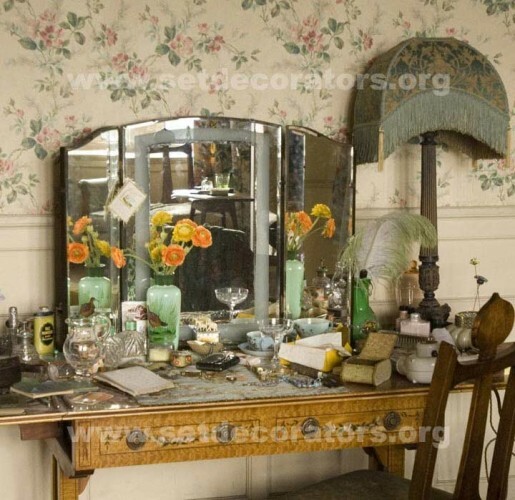 For Katie and her lot that was an immense feat, trying to get 40 or 50 beds the same, plus all the period instruments and equipment in the numbers we needed.” London sets also included Cecilia’s Apartment, the Tea House, Nurses’ Quarters, Bomb Shelters and the Television Studio. The greatest challenge of the film was the Evacuation of Dunkirk. After Greenwood’s research visit to Dunkirk she was certain they could find a perfect location in which to re-create the Northern French town along the eastern coast of England. She and Location Manager Adam Richards drove the entire coastline, discovering the town of Redcar in a sandstorm. 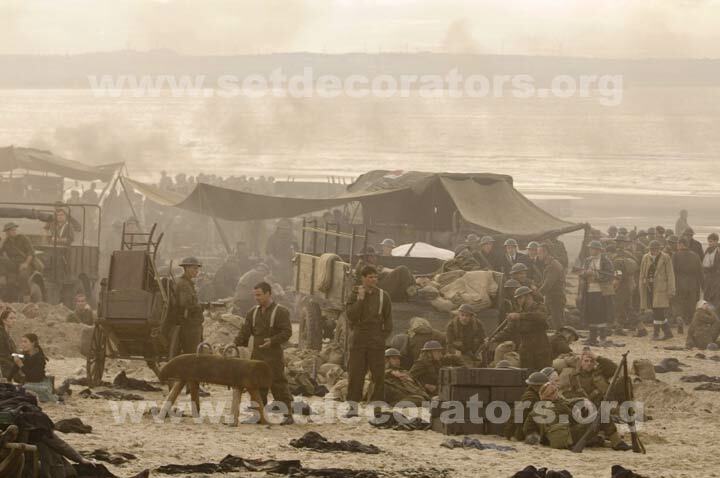 One thousand local extras were required for an epic five-minute uninterrupted traveling shot of the wounded and dying UK soldiers stranded on the beach at Dunkirk while awaiting safe passage home. 300 crew members worked together to create this sequence. One day was given to rehearsal and the next day the long tracking shot was filmed. Everything had been so well planned ahead and executed that no real changes were made. Greenwood knew where the best angles were on the beach and Spencer’s people filled them accordingly. For a reference point they used a huge tin barge, which they beached to look as if it were ready to sail. Greenwood recalls, “We thought, ‘Oh that will be easy. We’ll sail one up and we’ll just beach it.’ And of course, you can’t because of the rocks out to sea and other nautical problems. 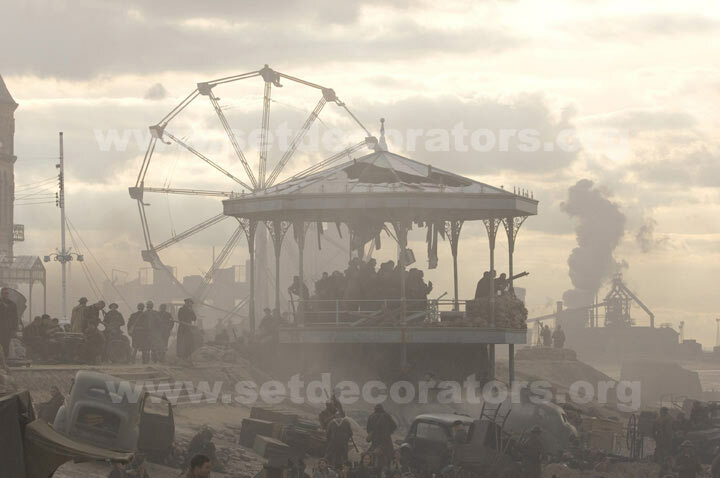 So Katie worked it out and eventually it was delivered in four parts, with the largest crane in the world lifting it onto the beach from the road.” Other boats, tents, vehicles and thousands of bits of set dressing were brought in to add realism to this surreal scene. “This is where Joe is great,” states Greenwood. “He has great faith and trust in us. We’ll give him as much as we possibly can, and you know he’ll work with it. We only had one day with a thousand extras. It was amazing. Everybody just brought so much to that. And it could only have ever been with that amount of effort that everybody put in. Director Wright, Production Designer Greenwood and Set Decorator Spencer are currently collaborating on their next production, THE SOLOIST. Spencer & Wright’s work on MISS PETTIGREW LIVES FOR A DAY, set in the London society world of 1939, will be in theatrical release March 7th.